PRINT&SIGN is the most important exhibition for printing and signaling industries in Southeast Europe. The PRINT&SIGN 2019 will be held from 09 to 12 October, Romexpo exhibition center, Bucharest. Why exhibit and attend at PRINT&SIGN 2019 Bucharest? Adapted to the needs of Romanian graphic industry and its clients, PRINT&SIGN – has proved to be a real success from its very first edition, in 2002. Since 2014 PRINT&SIGN has imposed as the most important exhibition for printing and signaling industries in Southeast Europe. Enlarge your client portfolio through direct contact with well-targeted industry specialists. At its previous edition, most visitors came from advertising production and textile industry, followed by advertising agencies and interior design. Leader exhibition – be among the leaders of the industry! You’re joining the most important brands from printing and signaling industries, PRINT&SIGN being the launching stage of new trends and field innovations. Decision making visitors:56% of the visitors attending PRINT&SIGN 2017 were entrepreneurs. They were followed by marketing managers (12.17%) and acquisition managers (12.11%). Business development opportunities. 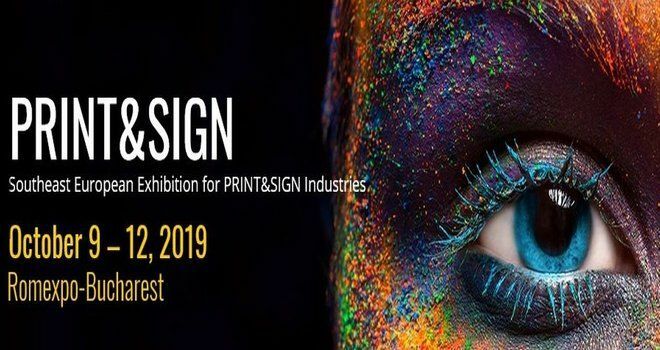 Exhibiting at PRINT&SIGN 2019 offers you the opportunity to promote your products and conduct market researches in order to boost your selling process. Promoting your company’s image. You can initiate marketing and branding activities among a well- targeted audience. For exhibition stand design and construction at Thermprocess, please contact our sales team.